I am new to the Honda VTR but not new to motorcycles. 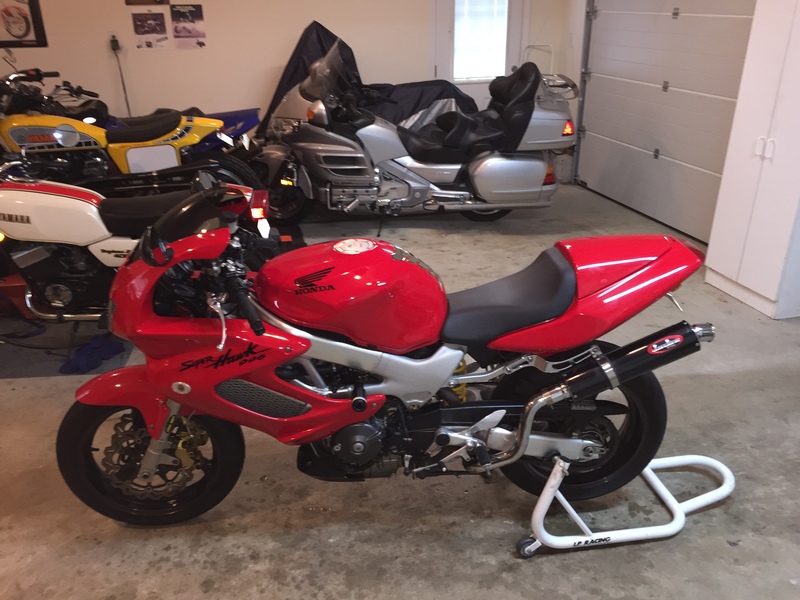 I had been looking for Honda RC51 for a while but I couldn’t pass this up when my brother’s friend offered it to me at a great price. Just wanted to thank Forum Members Rick for the front forks, Jack Flash for the carburetor parts, CaptianChaos for the killer exhaust and 2whltuner for the brakes. All of these parts and the general knowledge on the forum helped me bring this bike back to life after being storage for 8 years. I love the bike and I plan on keeping it for a while. Sweet sled brother and congratulations. A properly sorted SuperHawk makes a great stable mate. Congrats on the score. Very clean, and you have some nice rotors! Thanks guys, I love the bike and I cant wait to do a track day with it. I'm a new SH owner and I'm having a bit of a issue. I have a 98 and the choke is not throttling the bike up at all. Just happend out of the blue. The bike idols fine between 1200 and 1500 rpms but when I attempt to give it has it pops and acts like it wants to cut out. I usually open the choke for a few then close it seeing as how is getting chilly. No response. Took it for a run around the block and have lost some power. It feels and sounds like I'm taking off in 3rd gear as appose to 1st. Maybe the dreaded plastic choke fittings are broken? Yes sounds like the chokes are stuck open. When I give my bike gas with the choke on it will act like that. Runs way too rich. I agree with kenmoore . Sounds like the choke fittings going into the carb are toast. Pull the tank and airbox and give them a good one 2 during examination.